In the Gire 1 camp for internally displaced people, near Yola, Nigeria, a father holds photographs of his eldest daughter, 18, and his 6-year-old son, both of whom were kidnapped by members of Boko Haram during an attack on the family’s village. 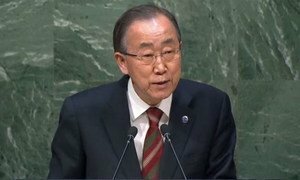 “We are all appalled by the barbaric crimes that groups such as Da’esh, Boko Haram and others are committing against humanity,” Mr. Ban told Member States of the UN General Assembly, noting that the threat of violent extremism is not limited to any one religion, nationality or ethnic group, but that the vast majority of victims worldwide are Muslims. Extremists has “brazenly kidnapped” young girls, systematically denied women’s rights, destroyed cultural institutions, warped the peaceful values of religions, and brutally murdered thousands of innocents around the world. “[They] have become a magnet for foreign terrorist fighters, who are easy prey to simplistic appeals and siren songs,” explained the UN chief. In his new strategy – called the Plan of Action to Prevent Violent Extremism – the Secretary-General calls for a comprehensive approach encompassing not only essential security-based counter-terrorism measures but also systematic preventive steps to address the underlying conditions that drive individuals to radicalize and join violent extremist groups. It appeals for concerted action by the international community, and provides more than 70 recommendations to Member States and the United Nations System to prevent the further spread of violent extremism. The recommendations are based on five inter-related points: putting prevention first; principled leadership and effective institutions; joint promotion of prevention and human rights; “all of Government approach”; and UN engagement. “We also know the critical elements for success,” Mr. Ban said, before listing them. “Good governance; the rule of law; political participation; quality education and decent jobs; full respect for human rights.”The Plan is accompanied by a letter from the Secretary-General to the President of the General Assembly, where he puts forward an “All-of-UN” approach both at Headquarters and in the field to support national, regional and global efforts to prevent violent extremism, and assist Member States in developing National Plans of Action. “We must also engage all of society – religious leaders, women leaders, leaders in the arts, music and sports,” he added. “This General Assembly is the only universal forum with the legitimacy with the legitimacy and universality to address this problem in all its complexity,” he concluded, calling on Member States to forge a new global partnership to prevent violent extremism. Meanwhile, in his remarks, the President of the General Assembly said confronting and preventing violent extremism is fundamental to protecting our societies and populations. “It is a timely one, particularly given that the General Assembly will review the Global Counter-Terrorism Strategy later this year,” he added. Sharing his thoughts on the direction of the United Nations’ work in 2016, Secretary-General Ban Ki-moon today said the global community begins the year needing to get its “priorities right,” while underlining that more and better work needs to be done.